Two weeks ago Auckland Council announced plans for potential redevelopment of Auckland's Civic Admin Building and new buildings and laneways to occupy 5000 square metres of land that are mainly used for car-parking associated with the old Civic Admin Building. The announcement was covered by NZ Herald and I blogged reasonably grumpily about it here a couple of days ago. In the course of that work I discovered the Aotea Quarter Framework (adopted by Council in February this year) and also came across a comprehensive heritage assessment of the Civic Admin Building. There appears to have been some limited debate about this initiative on Cllr Chris Darby's facebook page. As Deputy Chair of the Auckland Development Ctte he is pictured in, and introduces the Aotea Quarter Framework. 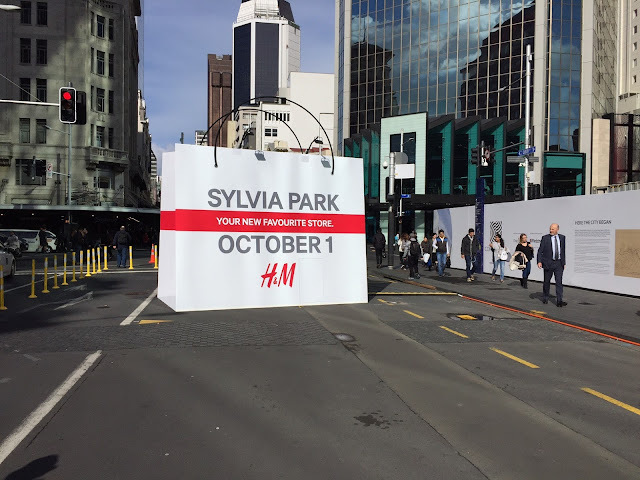 This document has similar structure and format as the Downtown Framework document which was part of the planning processes undertaken by Auckland Council under-pinning its initiative to dispose of Queen Elizabeth Square and to make way for a shopping precinct development accommodating "H and M" and "Zara" brands (and to net itself around $27 million). The map of Aotea Square above (copied from the Aotea Quarter Framework) shows in pink land areas labelled in the legend as "Future Development Opportunities". One of these is labelled "Civic Admin Building". As far as I am aware this map is the first and only public indication from Council that those areas are presently regarded as "Future Development Opportunities". The first off the block was introduced to the public by Panuku Development a couple of weeks ago in a media release. 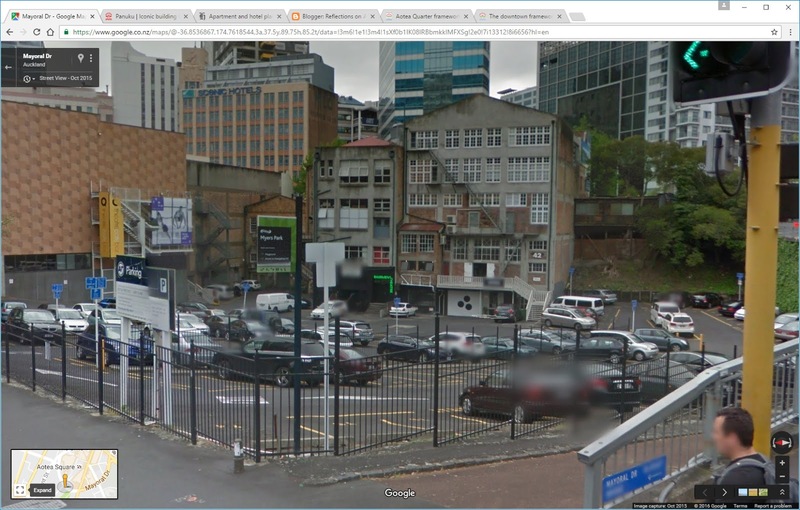 What I haven't seen, and what I'd expect to see was more of a master-planned approach to the whole Aotea Quarter area. This would be an integrated plan (including detail for example of the proposed Aotea Station). The Civic Admin Building area would be seen as a supporting and coherent segment within that whole Master Planned approach. That sort of planning would incorporate the guidance contained in the heritage assessment for the Civic Admin Building, and it would show the relationships between the various segments. Of critical importance it would reveal the landscape architecture thinking needed to inter-relate proposed buildings with public spaces. 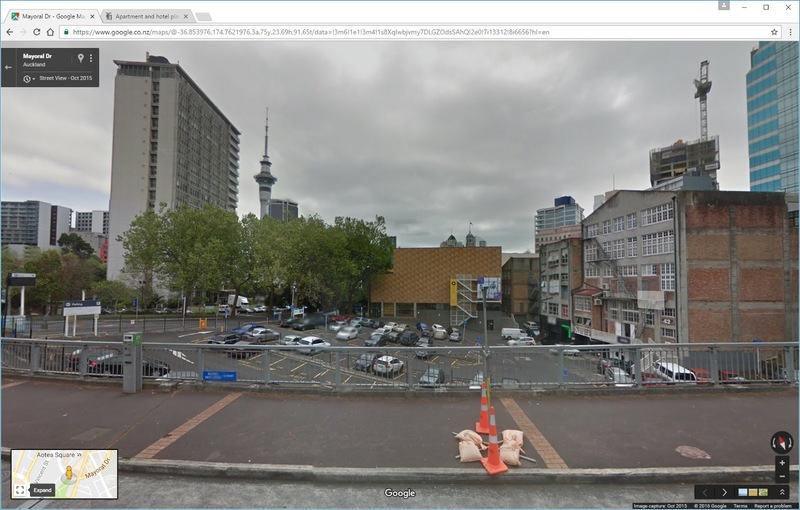 This streetview image looks North along Grey's Ave toward the Aotea Carpark entry. 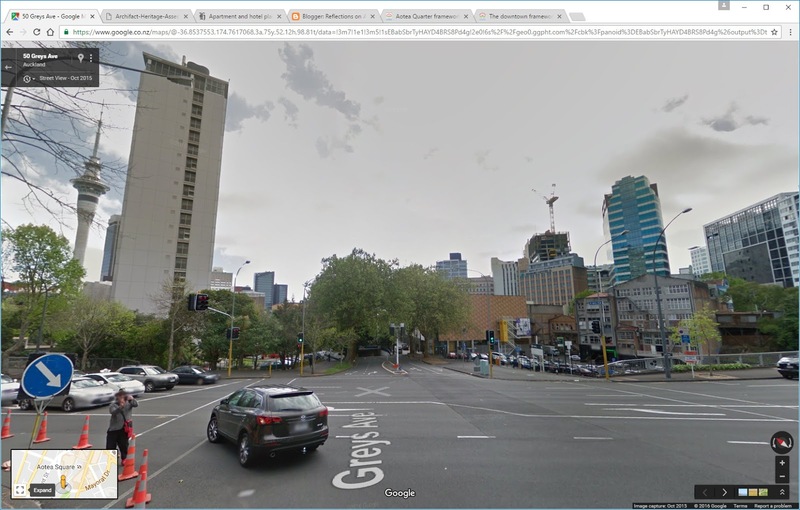 The Civic Admin Building is to the left, the proposed redevelopment of one of the pink developable sites in the map named "Civic Admin Building", will align with the west edge of Grey's Ave shown here to the corner with Mayoral Drive. From this point of view the proposed new apartment building would block the view of the Civic Admin Building (no bad thing some might say). But there's more to it. Across Grey's Ave from the proposed development is the Victorian remnant of this part of CBD. This is another closer view of it (to the right). This is the rear of the historic cluster of shops and including the Q Theatre. The entries and exists and stairwells in and out of the rear of this Quarter - perhaps I'll call it the Q Quarter - are interesting dynamic. This is a closer look. The land used for carparks is also a "Future Development Opportunity" according to the Aotea Framework. Point being that the way this is developed, and the opportunities for that development, and how it inter-relates with this urban fabric, will be affected by what happens the other side of Grey's Ave. At the very least the tall apartment building proposed will block much of the sunshine into this lower lying site. Considerations of linkages between the two sites - which are presently divided by Grey's Ave as it dives into the carpark - could be provided by pedestrian bridge. 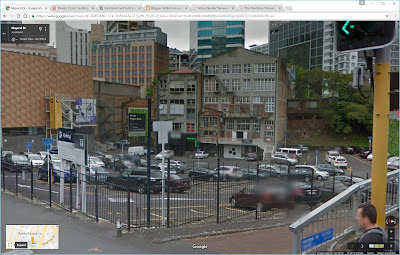 And rather than presenting a concrete back to this site, buildings on the southern edge of the Civic Admin Site could open to a laneway connections to the Q Site (called "Town Hall South" in the Aotea Quarter Framework - despite the fact this site is right next to a thriving combination of entertainment and Q theatre culture). 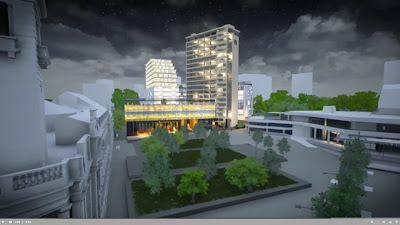 This image is a grab from the promotional video that goes with the proposed Civic Quarter development plans. Appropriately it shows Aotea Centre in the dark (and the old Town Hall for that matter). 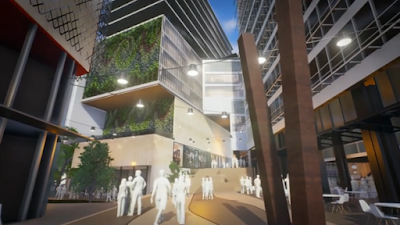 The northern edge of the proposed development has elements that suggest its designed to inter-relate with Aotea Square public open space. And that is to be commended. However what is really needed in the overall plan for the Aotea area is also to address the poor civic open space engagement with Aotea Square that has been built into the Aotea Centre. Sure there's a challenge for Auckland Council in deciding what to do with the Civic Admin Building. However by opening up the ground floors to limited retail, and good easy access food and beverage, and incorporating 200 apartments above, will by itself be transformative. Adaptive re-use of buildings deemed of heritage value is a common approach as cities undergo transformation. Re-purposing is a useful strategy in urban morphology. Which takes me back to Aotea Centre building. The Box Cafe has been a successful attempt to socialise this rather austere and uninviting facade. Ironically I found in the past it was mostly populated by Council officers from the Council Admin Building. Then I would say the title "Civic Quarter" might have been appropriate - just as Wellington is known as a Civic Centered sort of City as it houses Parliament, many Government buildings, and all of the employees who work in them. With the departure of Council HQ, Aotea Square has lost its civic heart, and renaming a quarter "Civic" won't bring it back I'm afraid. But I digress. A focus of the renewal and revitalisation of Aotea Square needs to be the edges of the Aotea Centre, and this comes down to what activities occur in those edges. Otherwise Aotea Square itself risks being left in the dark, with an internally focussed Civic Quarter (its edges may have potential - but so would activated lower levels of the Civic Admin Building - and it needn't be shrouded). Main takeaway: the whole area needs a good coherent masterplan - not just a framework (whatever that is in planning terms). Otherwise the short-term attractions of site specific development and private investment will compromise overall outcomes. 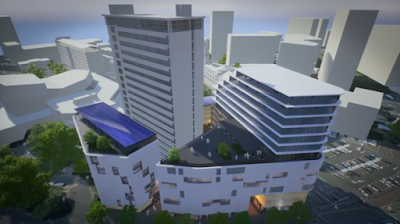 I planned this post without a case study, but then I read the “fact sheet” for the Aotea Square council headquarter building privatization deal sold along with 5000 square metres of land. The fact sheet which is very short of useful facts (sale price for example) says: “detail not finalised – will be left to the market…”. This is another example of Auckland Council selling public land, claiming a doubtful public benefit, giving the developer freedom to do what's best for the shareholder, and all to top up the jam jar labelled executive staff wages and professional fees. The market is the go-to justification for this increasingly frequent Council-led behaviour. 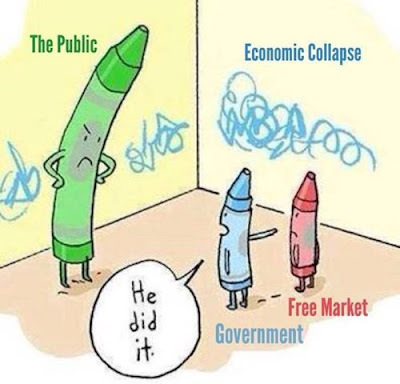 There is a presumption in the New Zealand political economy that the free market is the most efficient method of allocating resources and an assumption that everybody gains from the wealth that is created (trickle down). This is the heart of governance policies that gained traction and credibility under the leadership of Thatcher and Reagan….. But are markets free, and are public benefits inevitably produced, especially in urban development? An example of a genuinely free market might be the settler who walked up Gabriel’s Gully in Otago almost two hundred years ago, spotted gold lying in the stream, picked it up and took it to the bank in Dunedin. But most markets aren’t free. They cost. They take and they don’t replace in the case of natural resources, and they rely upon publicly funded regulatory systems to protect trades that occur between people. Markets exist where people want something someone else has, and rather than stealing it or killing the person to get it, money changes hands or some other contract is entered into. These market transactions have legal protections that can be enforced and infringements punished. The associated administration, legal and enforcement systems all have to be paid for. Free markets are never free. Just as there is a difference between private goods and public goods (goods in common – or common goods), there is a difference in markets used to trade private and common goods. A private goods market (private-market) offers the buyer the greatest freedom and the most competition (shoes, clothing, electronic goods, package holidays). While they offer freedom of choice, because private-markets are regulated (consumer protection, guarantee protection, health and safety, law of contract), they are not free of cost. Not very long ago public goods were provided entirely by publicly funded agencies. Typically these are services and commodities that are shared and essential in urban life (water and wastewater services), that have large common costs (roads, wastewater treatment plants), that are used in common (parks, libraries and stadia), and which provide social services (health, education, correction). The prices for these goods are not set by a “free” market, but by a regulator or public agency that owns and manages the commons-market (or public market) and which decides how much of the cost of those services will be paid for privately (user pays) or shared in common (publicly funded by property rates for example).The "free" market was generally put off the public goods market by uncertainties such as unpredictable demand, high infrastructure costs, unquantified maintenance obligations, and difficulties identifying revenue streams. Ways and means have since been developed to enable more and more of these public goods to be subject to market forces of one sort or another, enabling the private sector to become involved in the provision of public goods, and to profit from it. In a country like New Zealand, the concept of private-wealth is straightforward. Your house, your car, the money you have in the bank, and the other assets you own in sum generally equate to your private-wealth. But adding those private-wealth totals for all of the people who live in a city does not add to the total city-wealth. The missing amount is the common-wealth of the city. Every city, and every part of every city, every community, has common-wealth, just as every citizen who lives in a community has private-wealth. These two different components of wealth usually overlap. Thus the sales price of a house in a high-amenity suburb (in Auckland suburbs like Epsom, Herne Bay, Devonport come to mind) includes a common-wealth component which is effectively embodied in the value of the land, plus the value of the physical house itself (capital improvements). It is the common-wealth of an urban community that is particularly attractive to speculators. It is like the gold in Gabriel’s Gully. It is an untapped and un-mined resource. Central government and Auckland Council alike – given their mutual commitment to GDP growth - are motivated by the increased economic activity and taxes and rates and other revenues that would accrue from enabling developers and speculators access to this common-wealth. If only it were as easy as picking gold from between stones in a Central Otago river. Governance of urban redevelopment and intensification that fails to transparently account for urban common-wealth when freeing urban areas up for redevelopment typically leads to a reduction in community common-wealth which is banked as investor private-wealth gain. Obvious examples of common-wealth loss include larger school class sizes; more congested roads; increased risk of sewer overflows; perceived stranger dangers with an influx of settler residents; loss of community cohesion with increasing rentals and temporary occupants. Any one of these losses or damage to the common-wealth is felt by existing common-wealth owners. Unregulated speculators profit from a good level of common-wealth, and leave it depleted. Mutual benefit collaborative planning includes common-wealth accounting and cost-benefit assessment of options. Without such processes a state of revolt is predictable when a community is faced with the unknown impact of a “free” market redevelopment project. Without an appreciation of community common-wealth, an exciting redevelopment project (in the eyes of developer, investor and public authority leaders) becomes an act of piracy (in skeptical community eyes). It is an unfortunate tragedy of the Auckland commons that Auckland Council believes it is appropriate to feed and fund its hungry and bloated self from private development of public space and assets. These are part of the common-wealth of the city, and should only be traded in exchange for commensurate or better public space and assets. This is an important matter because the common-wealth of communities, of cities and of the nation is a measure of the quality of life. City common-wealth should not be sold to the highest bidder. Private markets exist to exploit and reduce the common-wealth for private-wealth. An important role local and central government is to promote, protect and build the common-wealth of citizens, for citizens. Politicians and officials and advisers who exploit or enable exploitation of the common-wealth of citizens beware. You are all on notice. 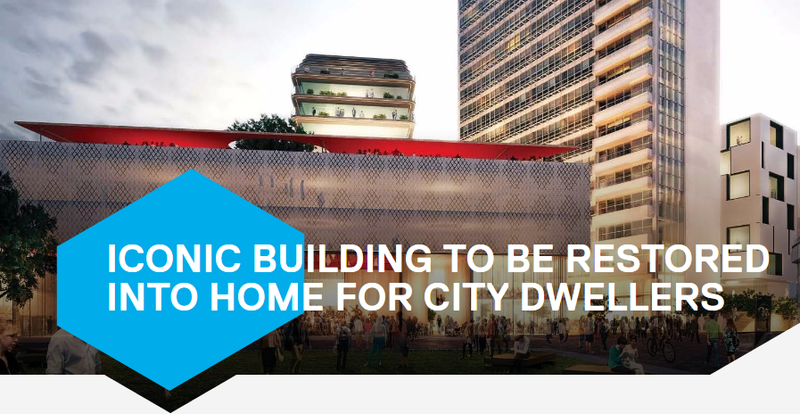 This image is copied from a media webpage of Auckland Council's CCO Panuku Development. It describes plans to privatise and redevelop the northern area of Aotea Square which presently accommodates the much debated former Auckland City Council HQ building. (By the way check out this fantastic heritage assessment). NZ Herald ran the resulting story here. Looking North I guess, with Mayoral Drive in the bottom foreground.... You can get a little more of an idea from Bob Dey's useful update here. He reports, "In a presentation yesterday, Panuku said the mix of development in the proposed Civic Quarter was still to be finalised. However, it would be market-driven, with a focus on quality outcomes..."
And looking South into the proposed development with the old Council HQ building to the right. According to the Panuku Development media statement: "The city’s urban development agency Panuku Development Auckland has selected Tawera Group to restore the Category A heritage building after an international tender process. Tawera’s Civic Quarter proposal features residential apartments in the upper floors with food and beverage facilities on the ground floor of the existing building. There will also be a new apartment building on the Mayoral Drive corner, a new boutique hotel on Mayoral Drive and a building featuring a Whare Tapere performance space fronting Aotea Square...."
These images are all about the new architecture. The plans lack the sort of landscape architectural perspective explaining how these new buildings and the spaces around them genuinely interconnect and inter-relate with surrounding uses. If anything, the urban design conclusion would be that to make the new buildings and the new north facing spaces between them work, the old HQ building should be demolished. So what started out being a project to get development interest in refurbishing and adaptively reusing the old HQ building (albeit with the need to remove its asbestos) - in the interests of heritage and other values - has turned into a project to build a new hotel, some new apartment blocks and a performance space fronting Aotea Square. These additional buildings will occupy the 5,000 square metres of public land that's proposed to be sold. Some "shared laneways" are promised. Is this the best Auckland can do here? And, did I/we miss something? 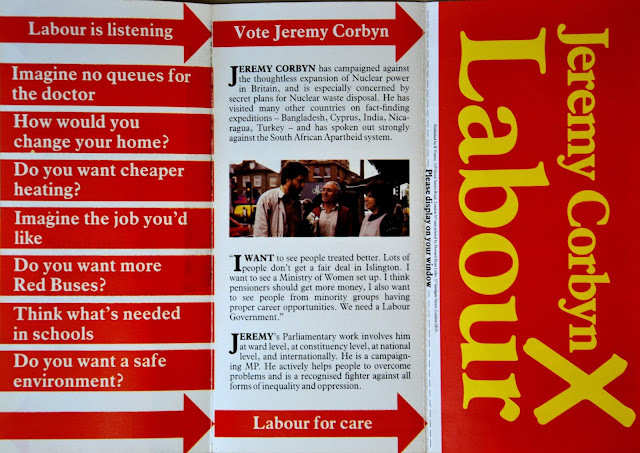 When was all this decided? Selling off 5,000 square metres of public land, calling it the Civic Quarter, makes the sale of Queen Elizabeth Square look like a sunday school picnic (only 1800 square metres of public land). It's been quite a challenge trying to reverse-engineer the decision-making processes involved. At its meeting of 8 December 2015, Auckland Development Ctte considered this report, and "noted the development work program". At pg 25 is the "Towards the Aotea Quarter Framework Feedback Report". This 42 page report which communicates the results of various research processes and is dated October 2015, concludes: "there was clear demand to see the Quarter developed to meet its potential with a very definite focus on making public spaces, activities, buildings and communication better contribute to its arts, diverse culture, entertainment and civic identity, as well as to be more accessible to wider groups of the public." This is followed with the 90 page Aotea Framework Plan (AFP) itself. I haven't looked at this closely. But the end sections give a flavour. A section on interdependencies states, "...The Council family needs to ensure that the outcomes of the Aotea Framework can be successfully achieved at all levels with a high level of inter-Council collaboration and alignment with key projects and large infrastructure development such as the City Rail link..." (sounds more and more like the QE Square story and justification all the time - despite the fact the Aotea Station is barely a twinkle in anyone's eye and doesn't appear in any of the available plans for the overall area). That's enough background for now. Here's my concern: the proposals for hotel and apartments in "two new buildings" will be snapped up by developers. Private commitment to the retrofit of the old CAB building will have to be paid for with public money. Especially with so much building going on across town, and the low hanging fruit of the new buildings. Also, how easy do you reckon it will be for Regional Facilities to get $90 million out of Council to do regional facilities upgrades and "active edges"? Pretty hard I'd say. This is desperate development stuff indeed. Perhaps there are good long term strategic plans for the whole Aotea Quarter - that are stimulated by the opportunities the new station will bring, and which will deliver the regeneration changes this poorly planned area needs. But this big picture vision seems now to be subsumed by the Civic Quarter plan and its private development carrots. Announcing these plans just a few weeks out from election day, with little if any public say along the way, not of any relevance anyway, isn't a good look for a Council bumping along the bottom of public approval ratings. I don't know what statutory processes and hurdles need to be crossed to get these plans over the line. You'd think that sort of information would have been considered by Council in a public agenda. But maybe all that's been delegated to Panuku Development. Just needs a nod from Council and Bob's your uncle. This is a far cry from the processes involved in delivering the Wynyard Quarter, and from where I'm looking and from what I've seen it's out of control. Council Candidates: make it your business to know what's going on in the heart of Auckland. Ask questions. 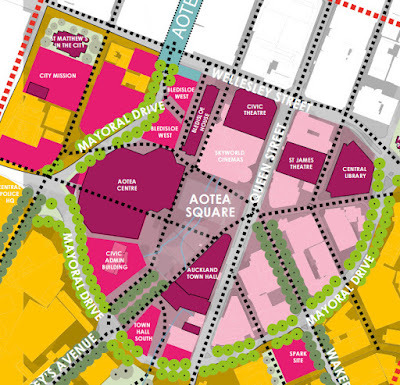 Aotea Square and Civic Quarter development plans need full public exposure and review. This map shows the location of a proposed Ryman retirement village in Devonport, North Shore, Auckland. 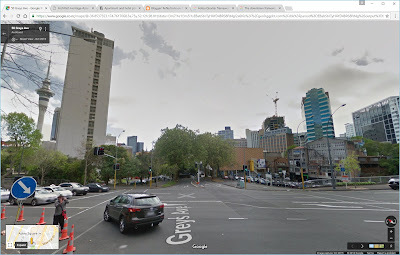 It's shown as the red area at the corner of Ngataringa Road and Wesley Street. Here's a closer view of the site in as it appeared in 2001. 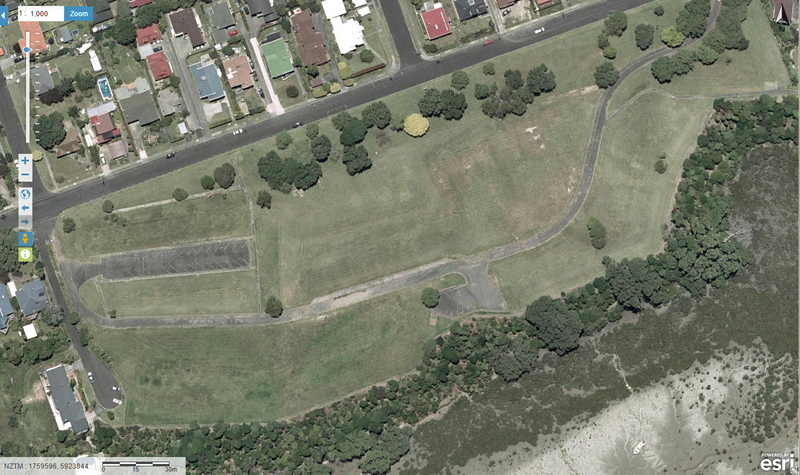 I lived in Ngataringa Road, Devonport, just along from this site in 1995. Navy ratings and couples lived in the two storey terrace-row houses that were built there in the 1950's I think. Relatively low cost housing. You can see in this 2001 aerial the density of development. My recollection and after reviewing the aerial is that there were about 90 separate housing units on the site. I remember there was some public use of the wide undeveloped area fronting Ngataringa Road (which runs East/West at the top). The land was designated for defence purposes, so it wasn't that welcoming. 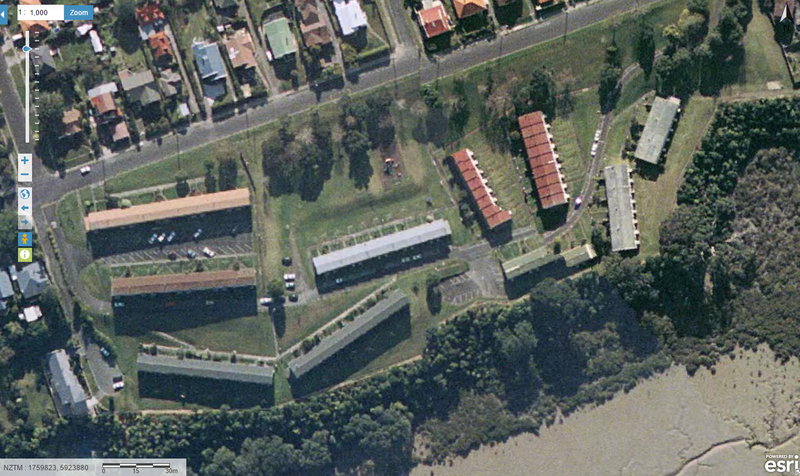 The bush clad area to the south became famous because an elderly resident decided there should be a walkway along there, outside the defence fence. It became known as Polly's Park. Polly was infamous because of her resolute objection to Pohutakawa trees. She'd take to them with a chainsaw given half a chance. 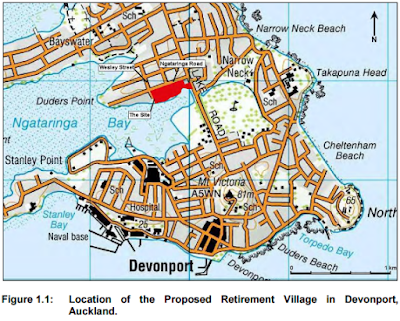 "The proposal offers an opportunity to develop a high quality, purpose built, secure retirement village on a rare underdeveloped site within the established residential community of Devonport and is close to existing infrastructure and amenities. The retirement village has been designed to sit comfortably within this neighbourhood - minimising any actual or potential adverse effects on residential amenity values. The proposed retirement village is considered to be appropriate for this location and will result in positive benefits for the community." The site plan for the proposed development is shown above, copied from Ryman's application document available at Auckland Council's site here. The buildings generally vary between 3 and 6 levels high. The descriptions of the open spaces indicate they are intended for the occupants. It is likely there will be concern at the intensity of the development. This will range from effects on the surrounding residential environment and local amenity, to effects on Lake Road traffic congestion. It appears there is also a question-mark over the future of Polly's Park also, as Rymans are keen to control their land to the edge of Ngataringa Bay. I also wondered about the viability and utility of a cafe at ground level. An amenity absent within a radius of 500 metres. Would also provide an outing opportunity for those less able residents, and those seeking an opportunity other than tackling Lake Road. My mother is in a retirement home in Timaru. She used to be in the active retiree section of it. I know she, and others sat out front hoping to see someone walk by who wasn't one of them. Preferably a child, or a parent with a child out walking. I think in this day and age more effort could be made by Rymans to better integrate this development into its whole urban setting - rather than making it secure, self-contained, fortress-like, keep the neighbours out. Almost like a defence establishment. "A more realistic population projection is 700,000 – 800,000 increase over the planning period through to 2041 rather than 1 million, but as future household formation rates are uncertain this does not necessarily mean that the target of 400,000 dwelling units overall should be reduced...."
The above is from the Unitary Plan Capacity for Growth Expert Conference Report 15 July 2015. The assumption that 400,000 new dwellings will be needed in a period when the population is expected to increase by 700,000 to 800,000 is erroneous. As noted on page 25 of the in the 22 July 2016 Independent Hearings Panel Overview of Recommendations Annexure 1 the household formation rate in Auckland has now reached 3.11 (the average number of persons/household). This is due in large part to the housing patterns of those new to Auckland and the changing housing patterns of those not so new to Auckland. On the balance of probabilities the rate will not drop below 3.0 in the next 25 years to 2041. “The expert group on residential capacity supported the Council’s long-term demand forecasts that estimate a population in the Auckland region of around 2.5 million by 2041, (today’s 1.5 million plus a further 1 million) with demand for additional dwellings of around 400,000 over that period." However, as above, the expert group did not support the prediction of 1 million new residents, and the assumption of around 400,000 new dwellings flies in the face of the population growth the expert group did estimate and the expected occupancy rate range of 3.0 or above. Taking the mid-point it can be expected that there will be around 750,000 additional residents in Auckland by 2041. At at least 3 persons per dwelling, around 250,000 additional dwelling will be required, an achievable average of 10,000 new homes a year over 25 years. At page 51 of the Panel’s Overview it is stated; "There are compelling reasons to ensure the Unitary Plan enables a development pattern that is capable of meeting residential demand over the long term and does not limit its focus to just the next ten years or so. The first is that housing development is not readily reversible and generally has an economic life of at least 50 years, so that once an area is developed according to an existing land use plan, future plan changes to that area are unlikely to have any effect on capacity until it once again becomes economic for redevelopment. Thus it is important that the Unitary Plan is calibrated to demand over the long term, and not to just immediate concerns." At least two points need to be made about the first reason. Planning based on the best available estimate of population growth and dwelling demand for the period under consideration, the next 25 years, cannot be said to be "focus(ing) (just) on the next ten years or so" or “calibrat(ing) to just (meet) immediate concerns.” The “long term” in the context of the Unitary Plan is 25 years, and no more. An obvious option is to, as the Auckland Plan envisions, provide for the next 25 years, i.e. a population growth of around 750,000 and the need for around 250,000 new dwellings; around 35% - 80,000 dwellings on greenfields, and around 65% - 170,000 within the existing urban area. The latter can be achieved with, by the figures in the Panel’s report, 40,000 dwellings on Housing New Zealand land, 85,000 on business zoned land leaving 45,000 to be built on urban residential land upzoned to allow for the construction of apartment buildings. This option would see the great majority of residential land in the urban area left in essentially its current state which would maintain, amongst other things, the current predominance of reasonably large lots in single ownership. What would happen then in 25 years? What needs will there be in 25 years that we can reasonably foresee now? We can foresee with 100% certainty that in 25 years, (and in 50 years, 75 years e.t.c.) the 2041 generation will have to decide for itself how to accommodate whatever growth is estimated at the time, and that it will need to be able to make decisions about the use of Auckland’s urban residential land in order to do that. The experience of intensification and growth in the period 2016 to 2041 will greatly inform Aucklanders of what is possible, and what they want. By upzoning only as much land as is required in 2016, and extending the urban limit by only as much as needed, the 2041 generation will be able to decide how much more urban land (most of which would still be in single ownership) to upzone and how much more greenfields land to develop; with consideration of future generations in mind. This is a pattern that could be followed for the foreseeable future. 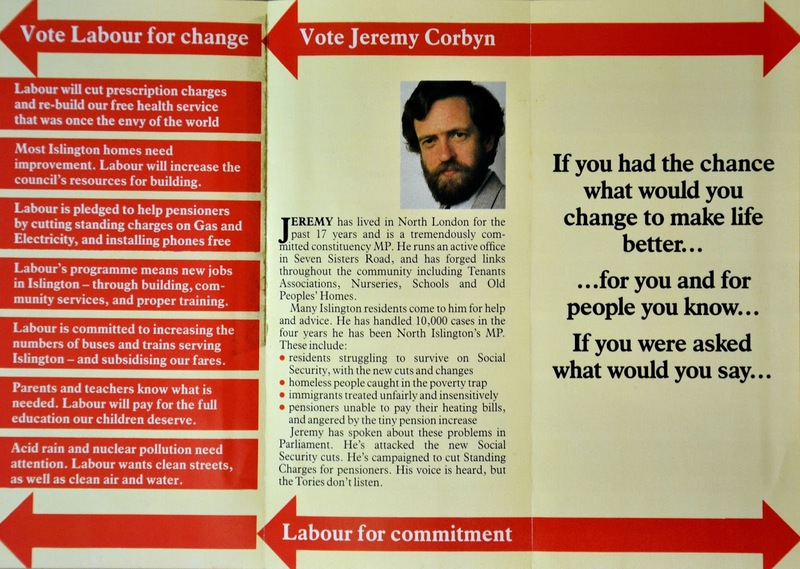 Jeremy Corbyn was my MP when I lived in North Islington on my OE. 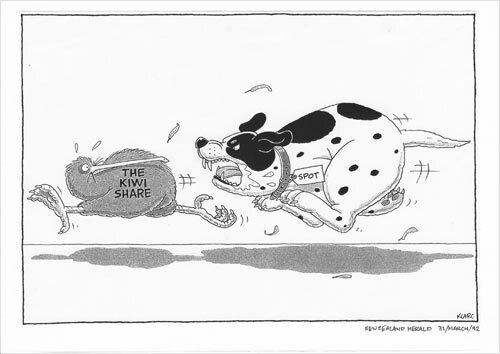 Almost 20 years ago I was the Policy and Communications Manager at TUANZ - the Telecommunications User Association of New Zealand - and became part of a campaign that ran for a few years, and eventually forced the Government to legislate and establish regulatory controls to direct the behaviour of players in the telecommunications market. This was in the teeth of an ideological insistence that the market knew best and should be left to its own devices in allocating resources and making investment decisions. Telecom advocated for this stridently with enormous resource at hand, and the threat that if it was regulated the NZ share index would be affected (Telecom shares making a big proportion) and that international investors would desert us. The Kiwi Share was incorporated into the privatisation of Telecom because it was widely understood that the public interest in the telecommunications network was the fact you could pick up a phone anywhere, and dial anyone else who had a phone. Thus the network was one network. It wasn't a cluster of separate networks. Though that was thought a possibility when Bellsouth came along with NZ's first major "cellular" phone network. To cut to the chase the economic idea was that innovation was a good thing and new entrants should be encouraged to come to New Zealand and establish competing phone services, and eat into the enormous monopoly profits that Telecom was earning from its monopoly network. For years Telecom recorded annual profits of close to a $1 billion, and used every trick in the book to resist regulatory change. TUANZ was part of the industry and user group campaign to impose regulation. And it was all pretty much based on the idea behind the kiwi share. People with a phone should be able to call anyone else with a phone - irrespective of the network they are connected to. But without some sort of regulation new entrants could only compete in little pockets of Wellington or Auckland. Peanuts. And paying to interconnect with Telecom was extortionate. The idea of regulating interconnection fees became obvious. So was the idea of number-portability - that you could take your phone number with you if you wanted to change provider. And so the mixed economy for telecommunications - a mix of private and public goods and rights (don't forget the rights) was established. All this is accepted today, and the basis for competition between cell phone providers. But it wasn't always so. What happened in telecommunications 20 years ago is happening today in urban redevelopment. Ideological forces are at work to further deregulate urban development - ignoring what could be called the Kiwi Share in a local community. That is a mix of amenities and social networks that make up a local neighbourhood. Something that markets have never been good at making, but they are quite good at disrupting and breaking. Governments need to understand and respect the Kiwi Share in communities when planning more rockstar economic interventions into New Zealand's existing urban fabric. It isn't all for sale because communities are not for sale, and they will certainly resist a pure market force approach. Don't forget the Kiwi Share. It's fair. According to Demographia (which is widely criticised by the way for the way it compares housing affordability between countries, but whose data for NZ is at least consistent), housing becomes unaffordable when the median multiple (housing affordability index becomes larger than 3. 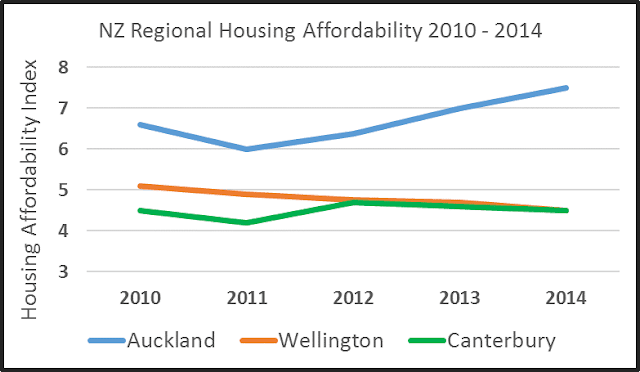 So you can see that using that measure housing is not affordable in any of these three regions. The fact is though, people are buying houses and living in them across NZ (that is quite apart from highly publicised incidents concentrated in Auckland where people are living in cars and caravans, and where social housing shortages are causing problems). 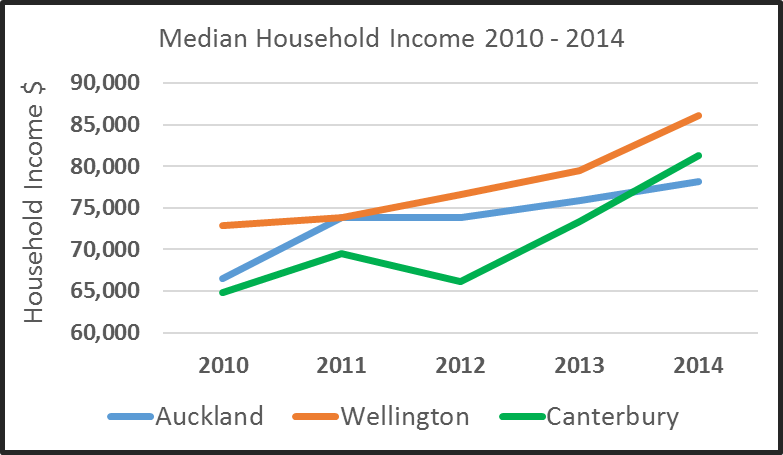 given NZ’s “rockstar economy” is increasingly dependent on Auckland’s growth – who is actually benefiting and why is Auckland’s population getting poorer? Before you read on, let me assure you I don’t have a neat answer. I just have more questions. What is the role of Auckland’s inflating house prices in stimulating NZ’s rockstar economy – and what is the cost imposed on Auckland communities? - Post GFC, official cash rates in developed countries plummeted to ensure that the availability and cost of loans was no obstacle to development and investment (See here.). Mortgages became cheap. Buying a house very suddenly cost much less. Demand increased quickly. Prices increased. The bubble started. - Immigration levels have increased dramatically to levels not seen in decades (See here.). Per capita they are now about 3 x as high as in the UK (pre Brexit). In addition to permanent immigrants there are at any one time about 200,000 temporary immigrant workers (who all need to be housed), and tens of thousands of students (mainly from Asia and India) who also need to be housed. The bubble has expanded as this sharp increase in immigrant population has taken up rental capacity and unoccupied housing. The effect of this sharp increase in temporary and permanent migrant populations has been concentrated in Auckland – especially since the Christchurch rebuild effort has tailed off. (Migrant labour has shifted to Auckland). The combined effect of these changes in Auckland has been the creation of an inflating housing economy which is highly attractive to investors (And it's planned). Investment comes from everywhere: retired mum and dad are putting their savings into investment units (you’d be mad not to with bank interest rates close to zero); investment funds are always looking for good returns; speculators with access to cheap mortgages; relentlessly mobile foreign capital attracted by websites, brokers, the feeding frenzy, and a government that has opened New Zealand for this sort of business. Many of these investment homes are unoccupied: why bother with the irritation of being a landlord and the risk of damage when the main objective is capital gain? But Auckland could not become the centre of this rockstar economy without other changes. Auckland’s economic powerhouse potential needed to be unleashed from the shackles of its existing communities, and their attachment to its sunny and relaxed attitudes and urban patterns. Auckland’s economic powerhouse potential needed to be unleashed from the shackles of its existing communities, and their attachment to its sunny and relaxed attitudes and urban patterns. And it needed to be separated from the protection of institutions and arrangements that stood for Auckland as it once was, that stood in the way of what it could become - an economic growth machine. Auckland supercity arrangements achieved that objective. While all this was going on outside Auckland (including regions where household median incomes are greater than Auckland’s don’t forget), Auckland was silent. 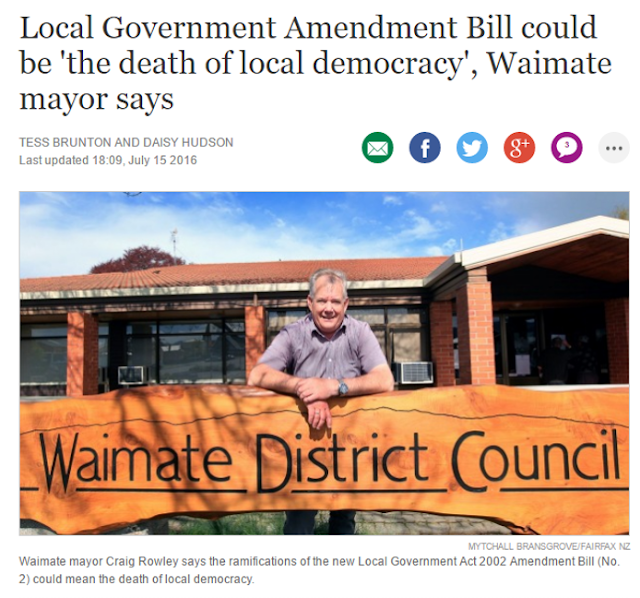 Its Mayor didn’t join the throng of New Zealand Mayors that stormed the steps of Parliament a couple of weeks ago opposing Auckland style changes in their towns and cities. Why bother Auckland's mayor to attend? It’s already done in Auckland. You’d thing someone might care that household median incomes are slipping back relatively in Auckland (especially when you factor in the increasing cost of housing) when it is being opened up for development and investment, you'd think that perhaps one of the main mayoral candidates might talk about this, and use their campaign to push back and seek change in the interests of Auckland’s existing communities. Campaign talk about more housing supply is cheap, comes easy, and plays more into the hands of those whose interests lie in expanding development and construction, than addressing the concerns of those who have already made Auckland their home. I agree with the spatial plan vision of redeveloping parts of Auckland that are low density and low urban amenity – ahead of converting rural land to urban land. That spatial plan was already agreed in 1998 – long before supercity reforms. But that history is not the only thing that seems to have been forgotten, or that has been lost in the bureaucracy that passes for local government in Auckland today. What has been lost, or is not recognised, or is no longer appreciated, is the fundamental place that communities need to have in rebuilding their own urban environments when they are in need of redevelopment, and their need and right to mutually benefit from that redevelopment. What has been lost, or is not recognised, or is no longer appreciated, is the fundamental place that communities need to have in rebuilding their own urban environments when they are in need of redevelopment, and their need and right to mutually benefit from that redevelopment. That’s not happening in supercity Auckland now. Auckland has by-passed its community heart in its local government re-organisation, and that has a cost - an economic cost - that is being born by communities that is not reflected in the rockstar economy numbers. The 2013 census records that 9% of dwellings in Auckland were unoccupied. Up from 6% the previous census. That's a further 18,000 empty homes, many of them owned by speculators. Why incentivise more empty homes, hollowing out communities? In 2014 Property IQ database records that in Auckland almost 1000 residential property sales were of vacant land. Why the focus on creating more vacant lots for speculation? Surely the focus needs to be on ensuring vacant land gets developed. In 2014 the data shows there were 82 resales of former "state rental" houses in Auckland. Between 2010 and 2014 the median price of this type of home increased by 51% - the largest increase of any housing type. Surely this is community theft. Despite the noise and back-slapping, the Proposed Auckland Plan by itself will achieve little for existing Auckland communities. Yes, some land-owners will be laughing all the way to the bank because of the immediate value uplift and capital gain it gives them. But without agencies and institutions at community level that gain the trust, participation and engagement of local people, there will be no urban redevelopment that results in the sort of mutual gain and community benefit that a country like New Zealand was once known for. Something can be done about this. At local level, at local election time, now, candidates could make a commitment to put communities and their economies ahead of GDP growth that only seems to profit the wealthy and those in power. At the very least candidates can commit to increasing Auckland Local Board powers so they have duties and responsibilities for local area spatial plans that emphasise community development and wellbeing, and that put communities at the heart. That would be a start. Local government has taken a hammering in Auckland and it needs repair. At national level action is also needed. I think there is a growing sense of dismay, alienation and disenfranchisment at community level, across the country - but especially in Auckland, caused by a systematic disabling of the sort of local government capability that is needed more than ever today. Changes are especially needed in Auckland, because of rapid urban changes triggered by high population growth. People will tolerate and turn a blind eye to inequality for a short while, suspend judgement while they accumulate capital, but even in Thatcher's Britain enough was enough and eventually the majority voted for a fairer and more equal society. Here in New Zealand it is time to put community wellbeing policy objectives ahead of national GDP growth objectives.